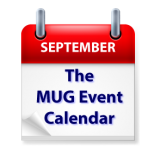 The first week in September gets off to a great start on The MUG Event Calendar, as groups come back from a holiday break. Joe Kissell will speak to a group in California, Maia Olson of Smile will make a visit to an Illinois group, and Allison Sheridan will talk about password management to another California group. Other topics on this week’s agenda include Photoshop, Lightroom, photo editing, Apple Watch, Garageband and more. Your group’s events could appear on The MUG Event Calendar. Put a note on your schedule for the first of the month and email the details of your next meeting to The MUG Center. Simple!